It's not you; it's Photos for iOS and OS X.
I just edited my albums on my Mac. The photos are in a specific order in certain albums, but this hasn’t synced to the iPhone or iPad. The photos are still in random order on those two devices. I haven’t been able to replicate this: All photos in my albums (tested under iOS 9.3 and OS X 10.11 El Capitan) retain their order synced using iCloud Photo Library. It’s possible there’s corrupt data. You can repair the library by quitting Photos, then holding down the Command and Option keys while launching Photos. You’ll be prompted to repair. This can take a while for libraries with thousands of images. Because you intentionally re-ordered images, you shouldn’t be affected by a sorting option you can enable, because manual changes override the option. 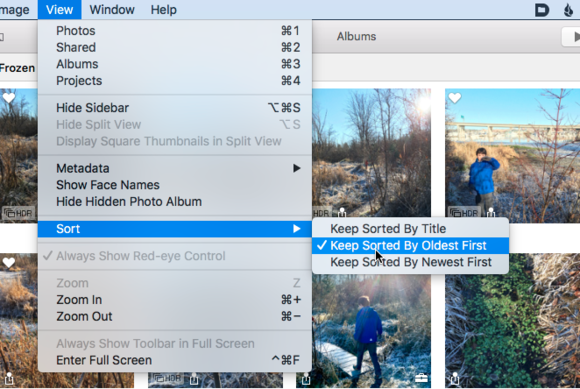 With an album selected, you can select View > Sort and choose one of the “keep” items that locks image sorting by a particular criteria. That can be by oldest first, newest first, or the photo’s title. You can lock the order of photos sorted within an album. Some people also see a related issue: The order into which they sort their albums in Photos on one device doesn’t sync and isn’t retained to others. I tested this in my setup, and found that all albums remained in the same sort order and that changed the order in one place was almost instantly propagated to another device. If this stops working, however, I haven’t seen any solution to set it right.